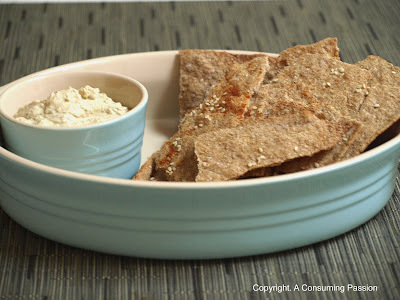 This month's Daring Bakers challenge was a first in that not only were we given a baking assignment - Lavash crackers - we were also asked to make a dip / spread to go with it. Having recently tried some really yummy crackers which M's mom made during a recent trip to Sweden, I was really excited about trying my own hand at making some. We were given the option of making regular crackers or gluten-free ones and I opted for the regular version. My main concern with this recipe was in making sure that the dough was rolled out thinly enough so that I would get really crisp crackers. Turns out I needn't have worried because misting the counter with some oil made it really easy to roll out the dough to the desired thickness. After sprinkling my dough with some paprika and sesame seeds, it was off to the oven. I baked my crackers for about 15 minutes, but in hindsight, could probably have left it in the oven for at least another 2 to 3 minutes. The edges of my crackers were really crisp, but tended to get a little chewy in the middle. Still, it made for a great snack both plain or with the aubergine dip that I made to go along with it. These crackers are definitely worth the effort so check out the recipe below. They look great Caroline. What flavour is your dip? Great work! I found one tray of my lavash was a bit chewy in the middle so I baked the second one for a bit longer and voila! It is hard to see from the photograph that I the middle is a bit chewy, is it possible that need to be bake a little longer? or maybe the middle part is a little bit thicker then the edge? They look great though! Cheers. looks good, an aubergine dip is definitiely a nice choice! I love how crisp they look! Great job! I'm so glad you enjoyed the challenge this month! They look really good! Oh yes, crisp and great! Love the pale blue dinnerware btw! Well done... The crackers look great! They look terrific! Well done! I love how thin your crackers are! Great job and nice presentation. your lavash looks nice and crisp! great job!